A cranberry, honey or a candy bar—which tastes the sweetest? These foods contain sugars that humans can perceive differently. A cranberry seems tart, whereas a candy bar can be excessively sweet, and honey is somewhere in the middle. 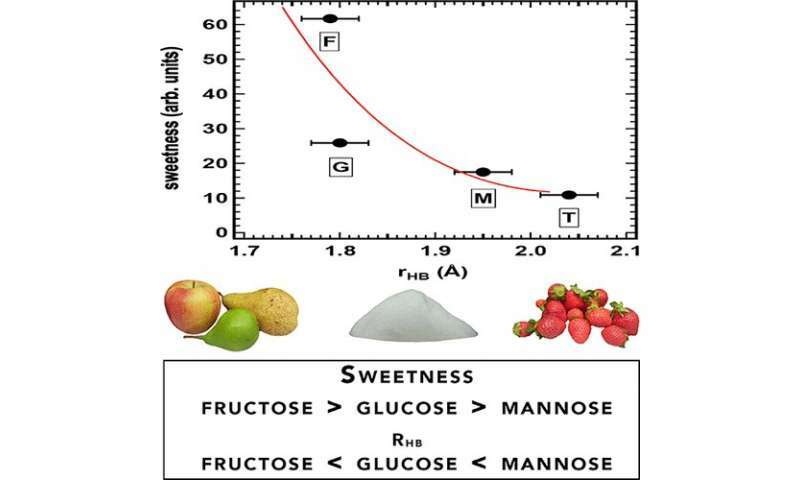 Now, in a study in ACS' The Journal of Physical Chemistry Letters, researchers have shown that the perception of sweetness depends on molecular interactions between specific sugars and water in the saliva. Neutron diffraction experiments have been performed to investigate and compare the structure of the hydration shell of three monosaccharides, namely, fructose, glucose, and mannose. It is found that despite their differences with respect to many thermodynamical quantities, bioprotective properties against environmental stresses, and taste, the influence of these monosaccharides on the bulk water solvent structure is virtually identical. Conversely, these sugars interact with the neighboring water molecules by forming H bonds of different length and strength. Interestingly, the sweetness of these monosaccharides, along with that of the disaccharide trehalose, is correlated with the length of these H bonds. This suggests that the small differences in stereochemistry between the different sugars determine a relevant change in polarity, which has a fundamental impact on the behavior of these molecules in vivo.